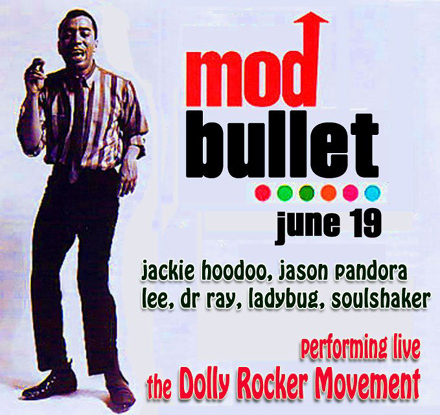 This Saturday, June 19 – The Bullet featuring The Dolly Rocker Movement, an Australian psychedelic garage band now based in LA with a new lineup consisting of members of Hot Hot Heat! Also DJs Soulshaker, Lee Joseph, Jason Pandora, Jackie Hoodoo, DJ Ladybug and Dr Ray laying down top Mod, Soul and Garage vinyl sounds! FREE b4 10pm! – Hollywood Studio Bar and Grill – 6122 W Sunset – Los Angeles, CA – plenty of free parking!